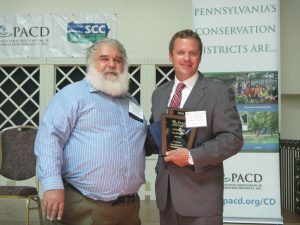 Conservation district staffs, state officials, and legislative partners convened in State College to honor conservationists during the PACD and State Conservation Commission’s 69th Joint Annual Conference. The awards luncheon took place July 27 at the Ramada Conference Center in State College, PA.
PACD President Glenn Seidel presents the Legislator Leadership Award to Representative Tommy Sankey during the PACD/SCC Awards Luncheon on July 27, 2016 in State College. Representative Sankey was nominated by the Clearfield County Conservation District. PACD is now accepting mini-grant applications for up to $2,500 to implement educational and outreach activities that support and extend the work of the Conservation Reserve Enhancement Program (CREP). Projects should focus on CREP enrollment, re-enrollment and/or CREP maintenance. Due to limited funds, only 5-10 projects will be funded this round. The deadline to apply is August 19, 2016. Click here for the guidelines. The application for the new CREP mini-grant program for conservation districts is posted here. Questions should be directed to Shannon Wehinger at swehinger@pacd.org. The National Association of Conservation Districts, in partnership with USDA’s Natural Resources Conservation Service, has awarded $2 million in grants to 42 conservation districts in 25 states to boost technical assistance capacity for urban agriculture and conservation projects. The 2016 grants will help urban farmers, community gardens, and other local agricultural partnerships implement conservation practices that support local food production, provide opportunities for education and stewardship, and protect natural resources. Congratulations to Allegheny, Blair, Lycoming and Montgomery County Conservation Districts on their grant awards! Click here for the full list of recipients. Photo provided by Berks County Conservation District. 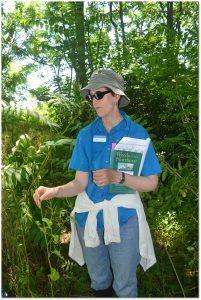 Berks County Conservation District hosted a CREP maintenance workshop on June 18, 2016 at a farm in Wernersville, PA. Mena Hautau, Penn State Extension, shared her knowledge of invasive weeds and weed identification. In the above photo, Mena is highlighting garlic mustard, which was found growing in the CREP buffer site along with several other invasive weeds. The annual PA Farm Bureau Tour stopped at the Brian Smith Farm. Photo provided by Wayne Conservation District. The Pennsylvania Farm Bureau held their annual farm tour in Wayne County this year. The tour brings together Farm Bureau members, PA Department of Environmental Protection personnel, and staff from conservation districts. The group visited the farm of Brian Smith, Bill Bryant’s Highland Farm, and the Calkins Creamery. Brian Smith’s farm suffered an incredible tragedy a few years ago when he lost his barn to a fire. The farm has changed its management style with the barn rebuild and features a bedded pack system. Conservation measures include no-till corn, cover cropping, rotational grazing, milkhouse waste water system, and stabilized lanes. The bedded pack is incorporated twice a day and cleaned and rebedded twice a year. Bill Bryant’s Highland Farm is a 6th generation family farm. The farm signed on as a conservation district cooperator in 1962 and has completed an amazing amount of conservation practices. They rotationally graze the dairy cows, have a watering system, stabilized laneways, streambank fencing, heavy use area protection, no-till cropping, and cover crops. Daughter Emily started the Calkins Creamery and it has become very successful. The cheese is sold at the farm, in local stores, at farmers markets, and shipped nationwide. In honor of Bill’s late son, there is an annual 5K race – Herd the Curd – that runs all over the farm pastures and fields. Highland Farm participated in the Four County Interseeder Demo this past June. His interseeded cover crop is germinating in less than one week. There will be a Corn Trials Field Day on September 14th and all are welcome to attend. Lunch was held at the historic Calkins Grange and prepared by the Calkins 4-H Clubs. This building is completely original and the Articles of Incorporation still hang on the wall over 100 years later. Chris Houser of Interseeder Technology plants covers crops into standing corn in Monroe County. 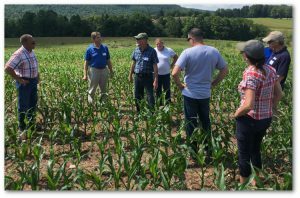 Lackawanna, Monroe, Susquehanna, and Wayne County Conservation Districts recently held an Interseeder Demonstration Day in each of their counties. 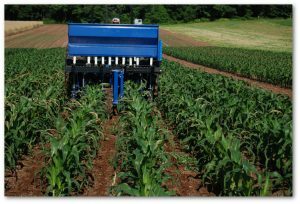 Chris Houser and Greg Roth from Interseeder Technologies brought the interseeder to northeastern Pennsylvania as part of a four-county effort to educate the farming community on the benefits of starting cover crops early. Fourteen farmers located across the four counties participated in the events. At each location, four different cover crop/cover crop mixes were used, each covering roughly a quarter acre. The cover crops were Annual Rye, Crimson Clover, Rye/Crimson Clover Mix, and T.A. Seeds Indy Mix (Rye, Clover, and Tillage Radish). This project was part of a Lackawanna, Monroe, Susquehanna, and Wayne County non-point source pollution grant. Photo provided by Northumberland County Conservation District. 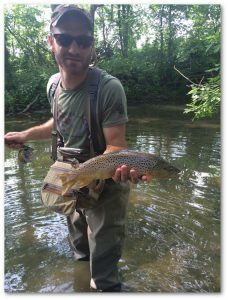 On June 5, 2016, a local angler caught this 19” trout on a fly rod in Warrior Run in McEwensville, PA. The fish was caught a few hundred yards downstream from a streambank restoration project completed by the Northumberland County Conservation District in May 2010. The project was funded through the PA Department of Environmental Protection’s Growing Greener grant program (Northcentral PA Conservancy was the grant recipient). The angler feels that the stream is cooler and cleaner as a result of the restoration project. and how other districts are working with nominating organizations and using associate director positions to build their boards. In addition, Wednesday’s banquet will offer a special musical program by educator and entertainer Van Wagner, and a surprise opening act featuring some of our own PACD members! If you miss Wednesday’s deadline, on-site registration will be available at the conference on a space-available basis, but why wait? Click here for more information or to register. Conservation District Watershed Specialist, Jared Zinn, assists workshop participants determine an ideal location for the overflow of their rain barrel. Photo provided by Greene County Conservation District. The Greene County Conservation District, in cooperation with Waynesburg Borough, recently held three workshops on the importance of reducing storm water and best practices for home owners. 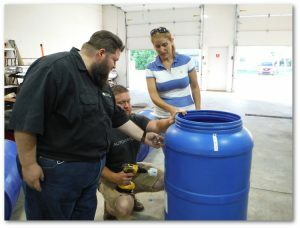 Thirty rain barrels were constructed during the workshops. Pictured are Army Corp of Engineers Senior Staff Biologist Mike Leggiero, PACD Executive Director Brenda Shambaugh, Pike County Conservation District (PCCD) Director Bob Engvaldsen, PCCD Executive Director Sally Corrigan, PCCD Vice Chairman John Milliken, PA Department of Environmental Protection Conservation District Field Representative Shane Kleiner, USDA Natural Resources Conservation Service District Conservationist Jen Matthews, and PA Department of Conservation and Natural Resources Assistant District Forester Mike Roche. Photo provided by PCCD. PACD Executive Director Brenda Shambaugh joined the Pike County Conservation District Board of Directors to celebrate the 60th Anniversary of the District. 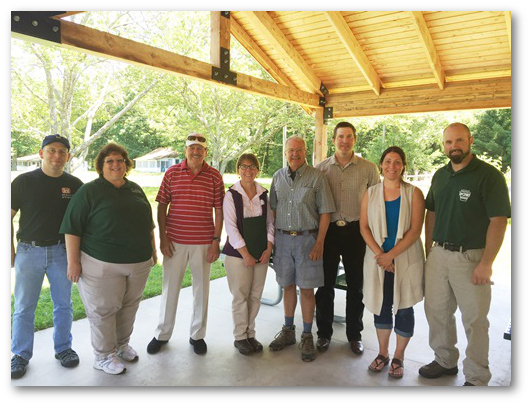 State legislators, county commissioners, and cooperating agency partners, joined district board members and staff at a picnic hosted by the District on June 24, 2016 at Delaware State Forest at Lily Pond in Milford, PA. Click here for more on the celebration.